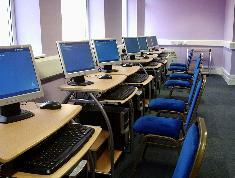 At BSS we have a state of the art ICT suite, which comprises 22 workstations. 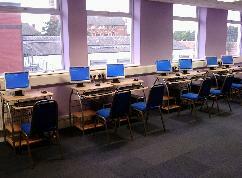 Each computer has Windows XP and Office 2000, with Norton Anti Virus and Broadband Internet access. All PC's are networked with shared resources such as printers and file sharing. Staff are availble on site to help with any technical problems you might experience. With natural daylight, disabled access, lift access, proximity to the City Centre and over 100 space FREE car parking this creates a perfect resource for learning. The ICT have also invested in a state of the art 64" Hitachi interactive SMART screen used to enhance teaching ability.